To find out the date, source, or time series of a specific count, just click on the point to get more information. Depending on whether or not there's a time series included, the points might look different. 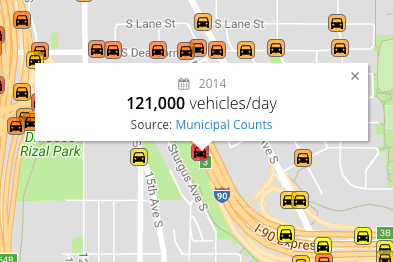 All counts can be visualized on the Overview map of your online Shared Reports. Just select from the drop-down whether you want to show "Car" or "Pedestrians". Click on the different points to see specific counts. These layers can be toggled on and off by any individual who you share the report with. 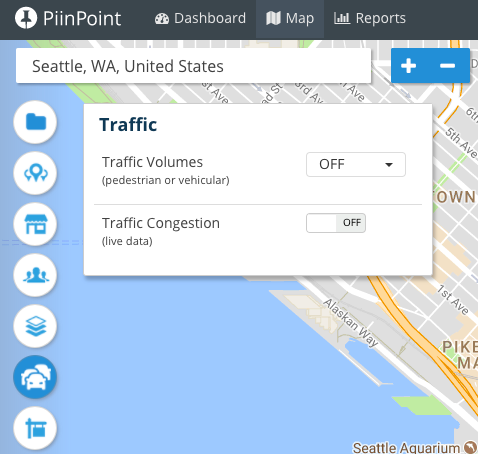 Use the PDF print tool to create a full-page PDF map showing traffic volumes.